Why do certain actors rub us wrong while other celebs steal our love? Hating Anne Hathaway has become a national pastime. But no one can get enough of Jennifer Lawrence. 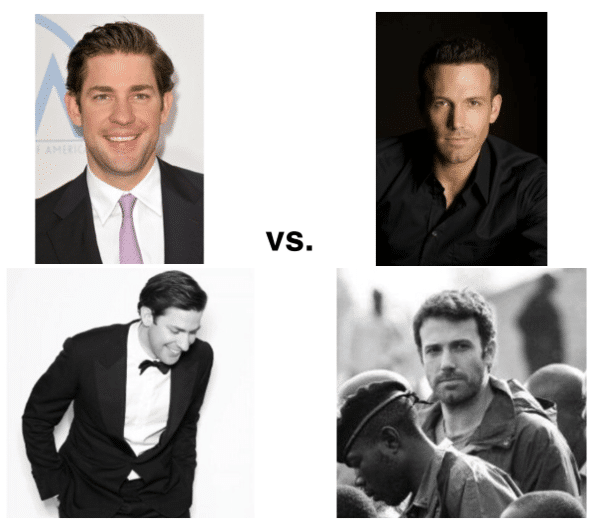 Ben Affleck was selected as one of the most hated celebrities of 2016, while John Krasinski’s goofy smile and hilarious pranks make us swoon. There is a simple reason why we hate Anne Hathaway and love Jennifer Lawrence. And it has to do with science. 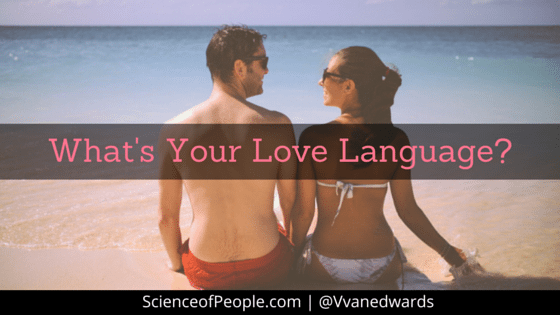 Humans are incredibly adept at picking up social cues – especially nonverbally. In my book Captivate, I show how researchers from Tufts University found that we judge people within .05 seconds of seeing their profile picture. And there is usually one big question we are trying to answer in that first impression: Are you an ally or an enemy? 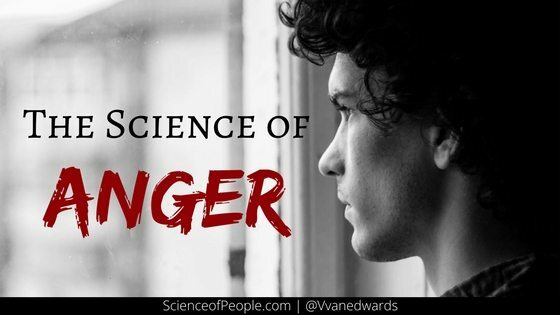 Here at the Science of People, we study the hidden forces that drive our behavior. We take the latest academic research and turn them into citizen science experiments to see how the science works in real life. 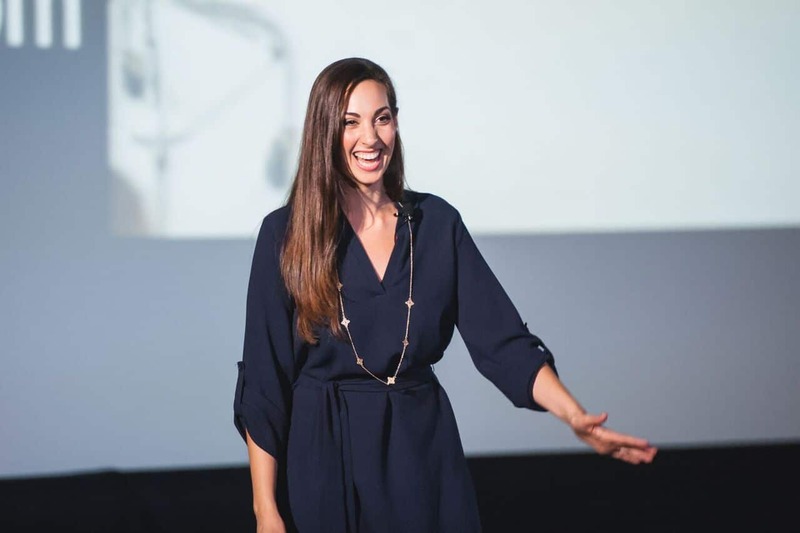 For example, Princeton University Researcher, Dr. Alexander Todorov found that different images of the same person can create drastically different first impressions. 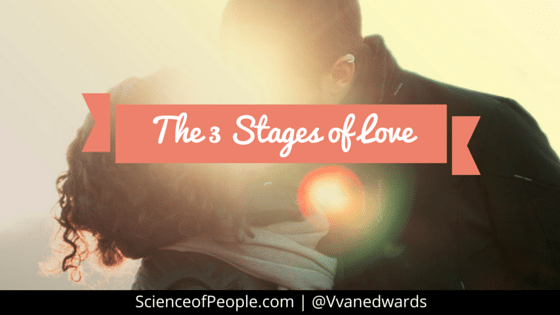 We often don’t know what signals we are sending. Anne Hathaway most likely has no idea that she is accidentally sending off negative cues in her most of her social profiles. Are you? Without realizing we might be hurting or helping our online brand. How do you know what signals your profile picture is sending? 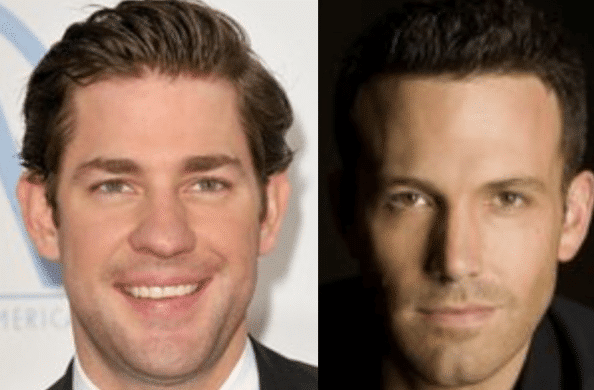 Let’s compare Anne Hathaway and Ben Affleck to Jennifer Lawrence and John Krasinski to find out. And to make sure you are not accidentally making the same mistakes. #1 Which picture is the most attractive? 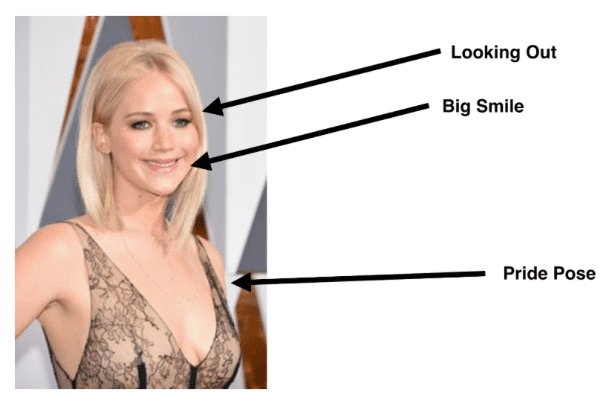 In this photo, Jennifer Lawrence is engaging in a few very attractive nonverbal gestures. She is pointing at her lips, which makes us want to pay attention to them. She has her chin angled down and is looking up at us through her lashes. This is the universal look of seduction. Researchers from the University of Brussels found that when we view someone from above we see them as younger and more submissive. Farhod P. Karimov and his team has participants look at different photos on websites. They found that ‘trust-signalling’ was an important social cue that is sent nonverbally. #2 Which picture is the most confident? Jennifer Lawrence wins this one again. Jennifer Lawrence exudes confidence, and we love to be around, to look at and to adore confident people. She is in the universal pride pose. Researchers at the University of British Columbia found that athletes across cultures stand broadly when they win a race and shrink down in defeat. When we look at someone’s photo we are trying to decide if they look more like a winner or loser–are they standing broadly and taking up space or are they contracting their body? Her wide smile and outward look signal optimism and forward thinking. A genuine happiness microexpression is universal. Dr. Paul Ekman found that across cultures, when we are happy we smile and that smile reaches all the way up into our eyes. We do this to signal friendship — a smile is the only facial expression that can be seen from 200 feet away! #3 Which woman would you want to be friends with? She sends off signals we do not like. Notice how Anne Hathaway’s IMDB picture is similar to Jennifer Lawrence—both are smiling and showing bare shoulders, but could not be more different. Why? Research has found that the angle of our face makes a huge difference for someone’s perception of us. We noticed that this had a significant difference on profile first impressions. We analyzed over 400 photos from the website HotorNot.com. 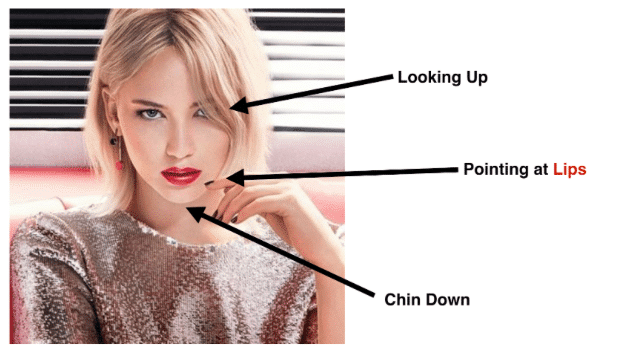 We found that when people angled their chin up in the photos, they had lower ratings. I believe this is because we do not like when someone angles their chin up at us — it makes us feel dismissed or belittled. Anne Hathaway’s Twitter Profile picture shows a bit of fear – wide eyes, lack of eye contact and a blocking behavior. Blocking is when someone places a barrier in front of themselves as if to block off connection. In our Hot or Not Study we found that the photos of people looking off into the distance or angling the body away from the camera had the lowest scores. 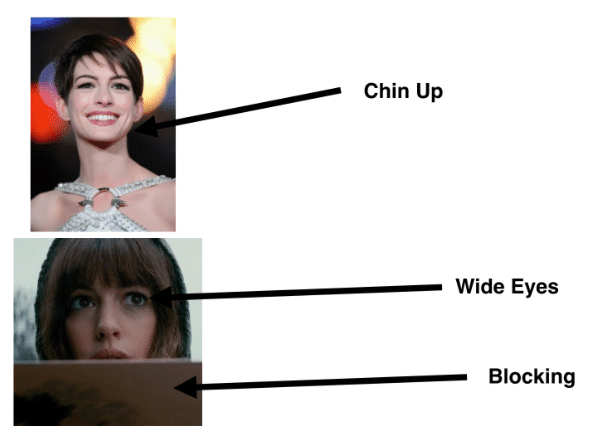 Anne Hathaway likely has no idea that her choice of photos are affecting her likeability. Be sure you don’t make the same mistake! Use a broad stance – It’s better to look like a winner. Take up space in your photo, put your hands on your hips, drape an arm on a chair and show that you feel confident. Make eye contact with the camera if possible – Try to make eye contact with the person who will see your picture by looking straight into the camera. If you want to be extra sultry look up through your lashes – This is a very flirtatious look, but if it feels good on you, then rock it! #1 Who looks more positive? 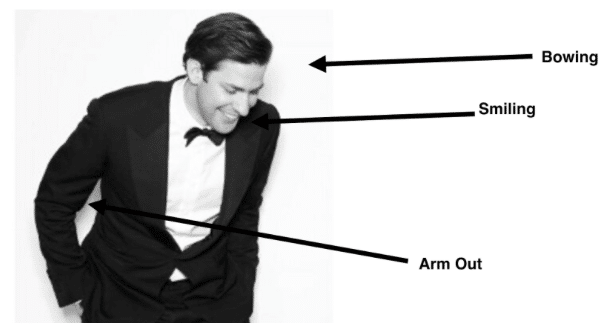 John Krasinski has a big smile—which according to Dr. Barbara Wild we find contagious. 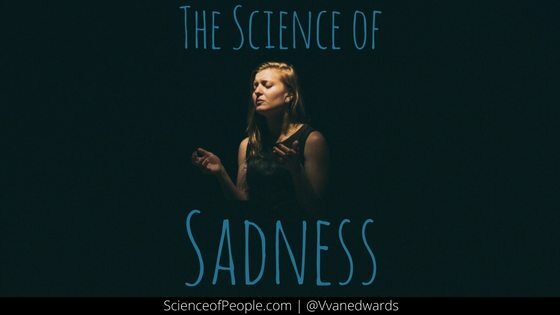 Dr. Wild and her research team showed people pictures of happy or sad faces. Then they gave them a series of mood tests. They found they could ‘infect’ participants with the emotions in each image. When people viewed a happy face, people felt happier. After viewing a sad face, people felt negative. They only flashed each image for 500ms and participants still caught the emotion. We like to be around positive people, and avoid negative ones. Dr. Michael Yapko has found that we are attracted to people with positive emotions because we catch the emotions of the people we are around. If we see a negative picture, we are less attracted to them because we worry about catching that negativity. #2 Who would you want to hang out with? Which guy would you want to come to your party? The difference here is subtle but important. Krasinski is bowing down—it shows humility and congeniality. We love this kind of photo. He is also smiling and has his arm out, still showing confidence. Again, Affleck is not smiling. And worse he is far away, this makes him feel emotionally distant as well. Having someone in front of him in the picture is also a kind of blocking (remember Anne Hathaway?). Smile – Don’t give a partial smile or a smirk, show positivity with an authentic smile. Don’t block – Try not to have anything in front of your body. The more open you can be towards the camera, the more open you look. Be in a broad stance – Look more like a winner! Take up space, stand broadly and show pride in your picture by not shrinking down. Don’t show contempt – Avoid that one sided mouth raise.